We spent two and a half weeks in Cape Town, relaxing, recouping, and planning for the next phase of our trip. We had expected Cape Town to be an 'easy' place to enjoy and we were not disappointed. It is very much like the US/California in terms of conveniences, language, weather, geography, etc. with the added benefit of a very strong dollar/rand exchange rate. We did all the 'must do' tourist things over our stay, but also took time to just 'hang out'. We moved around and stayed in four different accommodations, mostly because we did not have anything reserved when we arrived and the city was very busy. Although we were only able to plan in detail the next 2 weeks of our trip while in Cape Town, we felt that it was time to move on with our trip. We will give some details about our stay here, but since we stayed so long and did so much, we describe the attractions we visited and the tourist things we did in a separate section following the background and trip commentary. Neither of us knew very much about Cape Town before this trip. But when we were in college students at both our schools built shanty towns in the middle of campus to protest against South Africa's oppressive white apartheid policies and the Universities' investments in South Africa. Pressure from all over the world as well as internal rebellion forced the downfall of Apartheid in the early 1990's with the first real democratic election in 1994, bringing Nelson Mandela to power. Since the middle of the century the white only Apartheid government had created a very racially segregated country. At one point the government formally classified everyone into white (or European), black (or native), and colored (mixed) categories. Whites had full privileges, colored had some limited rights, and blacks were at the bottom of the list in terms of rights and privileges. 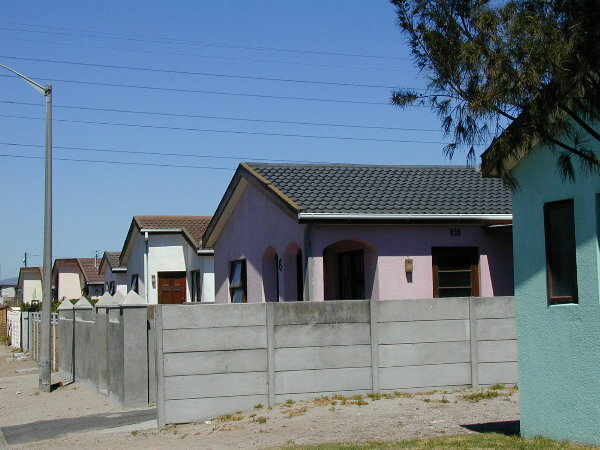 In the 1960/70's the government relocated blacks and coloreds from certain of Cape Town, leveled the neighborhoods, and started building white-only areas. The shanty towns built by students during college represented the new homes of the relocated people. The Dutch/British influence on Cape Town is clear from the architecture and street names. Afrikaans, the official language of the Apartheid government, derived from Dutch. Some of the colleges/schools have always taught in Afrikaans, partially as a way to limit the students to primarily whites. Cape Town has many mountainous attractions. Table Mountain, a huge flat- topped mountain, sits in the middle of the city, flanked by Devil's Peak on one side and Lion's Head, Signal Hill and the Twelve Apostles mountain peaks on the other. Much of the harbor and downtown portion of the city is 'reclaimed land' -- 50+ years ago they pushed earth into the ocean to make additional habitable land. Hundreds of blocks of the city is reclaimed land. Now it is not clear what is reclaimed and what is natural, but much of the flat land near the shore is reclaimed. One of the biggest tourist areas of the city is the V&A Waterfront -- somewhat odd since it is just a large upscale mall/food court on Table Bay, the bay on which the town is set. Most of the touring boats take off from Table Bay and the nicest hotels surround the mall area. 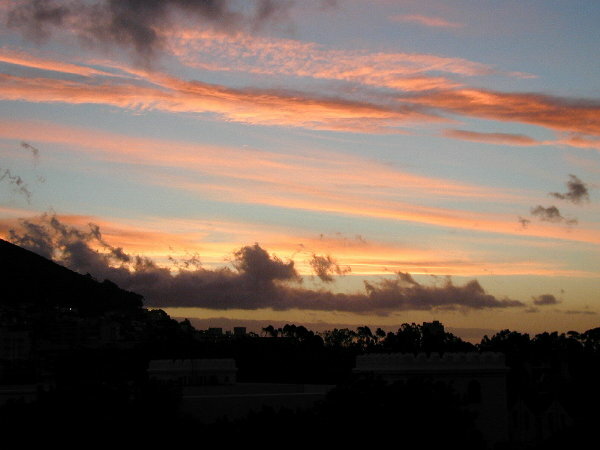 We were in Cape Town during the tail end of their Summer and we found the weather varied greatly. It was typically comfortably warm during the day, but some days were very hot (104ªF), and some were almost cool (65ªF). Most nights were comfortably cool, some very windy and chilly. And, of course, the wind could be gale-force, or stagnant. Most houses do not have heating or air conditioning, because there are very few extreme days of the year (we hit the hottest). During our Mt. 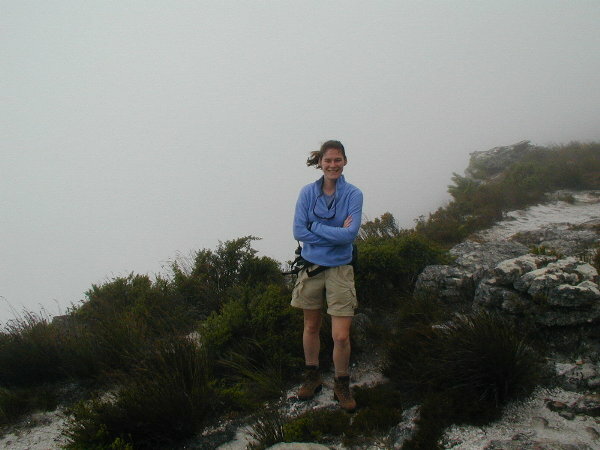 Kilimanjaro climb Tonya recommended places to stay, places to eat and things to do in Cape Town (she lived there for 3 years). So we entered the city with a long list of 'must see/do's. But after completing five weeks of non-stop traveling culminating in seven days of camping on Kilimanjaro, we also had a huge desire to do nothing. The 'do nothing' desire won out for the first 5 days. We stayed in a very luxurious suite at the Commodore Hotel and watched TV and movies, read books, ordered lots of room service, and walked the 3 minutes to the V&A Waterfront for food or light shopping. We started to get rejuvenated. We had only booked 5 days in the Commodore because that was all that was available and also because we wanted to have flexibility to find a better place. It was not until the 3rd day when we heard the howling of the gale force winds that we realized that we were in Cape Town during the 'windy' season. Truthfully, it was not until we jumped in a taxi in the center of town, and between telling us his opinions on Bush and Gore the taxi driver pointedly asked 'why are you here, now, it's too windy in February!'. For two days the patio furniture was blown across our deck, we could not stay outside on the deck without holding on, and we either got significant help or hindrance walking down the street. No exaggeration -- winds were as high 75 MPH! We heard differing stories on when the real windy season is, but we found out that Cape Town is known for very strong winds. We had considered chartering a fishing boat that first weekend but ended up blowing it off -- we could only imagine the waves and weather on the water. Near the Waterfront tthere is a Sunday market where hundreds of vendors sell roughly the same African artwork at a wide range of prices. On that first Sunday at the Green Point market, we ran into a friend/co-worker of Dan's (Eric Anderson) and his family on vacation -- what a small world! We went out to dinner with them one night and we ended up using the their tour guide to see some key attractions later in the week. We decided that we had to get away from the Waterfront to start seeing the 'must see/do' things on our list so we started looking for another hotel. We spent a day walking through 5 or 6 hotels from the Waterfront to downtown, inquiring about room types, rates, hotel features, and TV channel selection (a sore point for Dan!). We could not find anything as nice as the Commodore outside of the Waterfront until we hit the Cape Sun high rise in down town. It is an older hotel but when they showed us the Presidential Suite on the top floor of the hotel we could not resist. We talked them down about 50% so it was the price of a room at the Commodore. The suite had a great view of Table Mountain, had a huge living room with 3 couches, a dining room area with a table with 8 chairs, a bar, a large master bedroom, 3 bathrooms, and a Jacuzzi. Yes, it was a bit much, but we could not resist. We figured being away from the Waterfront would make us do and plan other things. That week we climbed Table Mountain, road the cable car, visited Kirstenbosch Botanical Gardens, Robben Island, and the Aquarium. 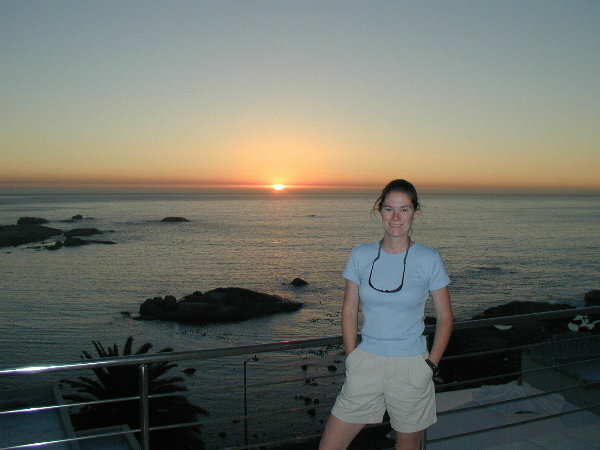 Then we hired a great tour guide who took us to the wine country, Cape Point and Cape of Good Hope, False Bay, Hout Bay, Stellenbosch, and cheetah petting, See Tourist Activities list for more detail. We had initially planned to stay in Cape Town only two weeks, but by the middle of the second week we still had nothing planned for after Cape Town. At the end of that week we started to plan the rest of our trip, or at least the next few steps. We had at least contacted A&K earlier in the week to help plan the steps, but had a hard time making quick progress. Jackie, our Cape Town tour guide, suggested Adele Wise, with Mushinda Travel, who is a specialist for South African travel. She came to our hotel late on a Friday morning with brochures and talked with us about what we wanted to do. She ended up meeting with us the night before we left town the next week to give us our tickets and vouchers for the next two weeks in South Africa. We decided to rent a car so we walked to Avis and Hertz to see what they had. Unfortunately they only had low end cars (no air conditioning) available on the weekend at the last minute, so we got a crappy little car. But it only cost $8/day! The next day we exchanged it for a car with air conditioning. Dan adapted quickly to driving on the left side of the road, but used the window wipers more than we needed -- the blinker and the wiper controls are on the opposite side of the steering column than in the US, so when he meant to switch on the turning indicator he turned on the wipers instead! 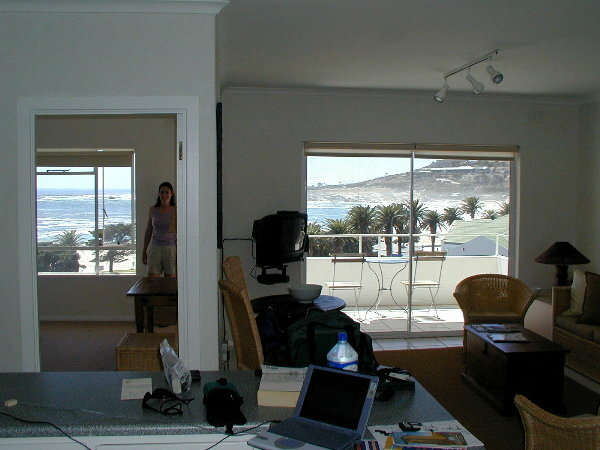 After five days in the Cape Sun and having seen so many other parts of the Cape, we decided to see if we could get a room farther from the city in Camp's Bay or another beach area. We checked out of the Cape Sun and drove down to Camp's Day and started looking for a place to stay. We had found a bunch of weekend lease places online but could not get any response from the sites. The beach was packed with people and people were waiting everywhere for parking places -- we realized that maybe a weekend was not the time to find a place with no reservation. We stopped by a housing broker and they confirmed that there was nothing available. We drove around some neighborhoods and realized that there were a number of houses with guesthouse' signs so we stopped in one of them. They had an 'extra' room that had an amazing view for only $100 so we took it. Zero luxury (except for the view) but it was a two minute walk to the beach and the main street with all the restaurants and the husband and wife owners were very friendly. It turns out that they owned a software company in Johannesburg and the husbnd had authored software methodology (UML) books. Dan avoided any detailed work discussions but they were very nice. After two days in the guesthouse the housing broker had a great third story apartment available overlooking the beach on the main street. Because it was a weekday, they were willing to give it to us on the weekdays for only $65! We spent the last days in Cape Town enjoying the Camp's Bay area restaurants and jazz clubs, and frantically planning the next couple weeks of our trip. We left Cape Town with plans for the next two weeks, but nothing confirmed beyond that! We can see going back to Cape Town -- it is a great place. Internet connection speed: Local ISP access 28-56kbs. The following sections provide details around the tourist attractions we visited and the tourist things we did. Table Mountain is the prime land mark in Cape Town since it lies in the middle of the city only about a mile from the shore. 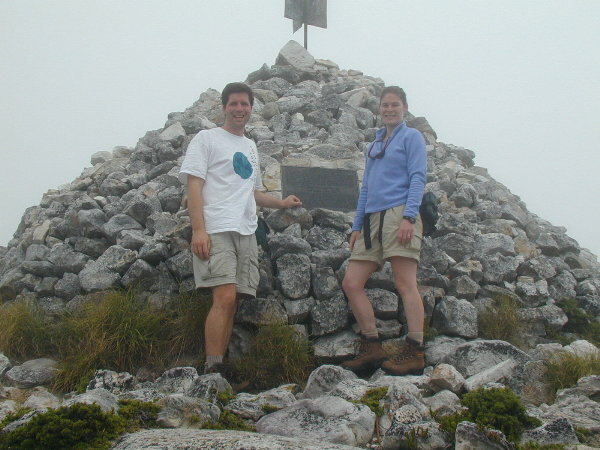 It can be seen 124 miles out in ocean, flanked by Devil's Peak and Lion's Head and is 3000 feet high at the highest point, Maclear's Beacon. It gets it name from its flat summit. On some days the clouds cover the whole summit and spill over the edge, like a table cloth. A cable car was installed in1997 so that you can easily get to the top where you get great views across the city and the Twelve Apostles mountain peaks extending southward from the city. We climbed the mountain instead of taking the cable car. We climbed from Kirstenbosch Botanical Gardens, up Skeleton Gorge, to Maclear's Beacon, and then across the 1.8km top to the cable cars. Unfortunately, we picked a day on which the table cloth was in place. The climb was very steep across ladders (literally) and steep ravines -- there was no one else on that path and we later figured out it was one of the steepest trails. It was a fairly short climb at 2.5 hours. As we got closer to the top, the clouds shrouded the path to the point that we were not sure where to go. We could not see more than 30 feet at the top and the wind was blowing at about 30 mph trying to push us off the edge of the mountain, where the path ran 3 feet from the steep drop-off. Because of the clouds it looked like we would fall into a bed of cotton. After only a few wrong turns, we made it to the cable cars across the summit and the skies were clear and enjoyed some beautiful views. 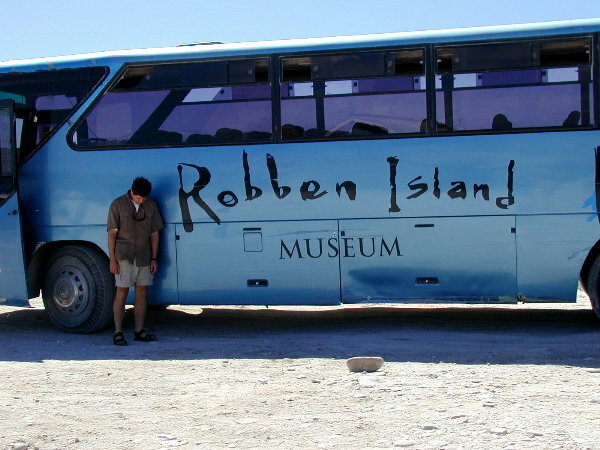 Robben Island is the infamous prison island in Table Bay where Nelson Mandela and other political prisoners were held during the days of Apartheid. It is 7 miles from V&A Waterfront to the 1428 acre island. Mandela spent 18 of his 27 years of incarceration on Robben Island. 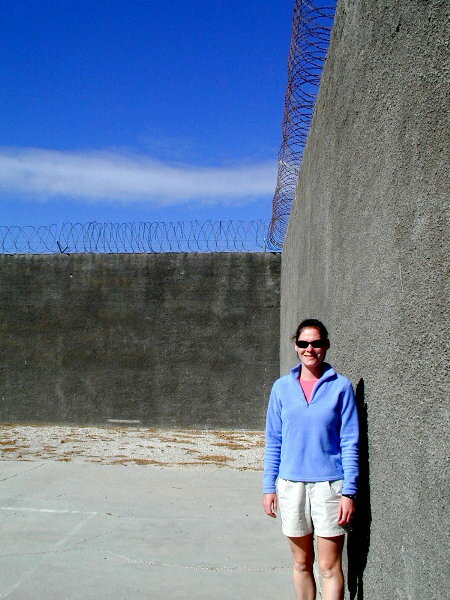 The prison was eventually closed and became a museum in 1997. Ex-resident political prisoners lead the tours of the island so we were able to get a real feel for what it was like there. Supposedly one of the best botanical gardens in the world. It does contain an amazing number of plants/flowers/trees across a vast area but we could not appreciate it as much as someone who knows more about the subject matter. We used the garden as a jumping off point for our climb of Table Mountain -- we heard that the actual garden border extends all the way up to Maclear's Beacon. The large mall on the V&A Waterfront that is oddly one of the biggest tourist destinations in Cape Town. It has one or more of every type store imaginable and has a large number of varied restaurants including a Hard Rock cafe and a Sports Restaurant. It also houses movie theatres and an amphitheatre. 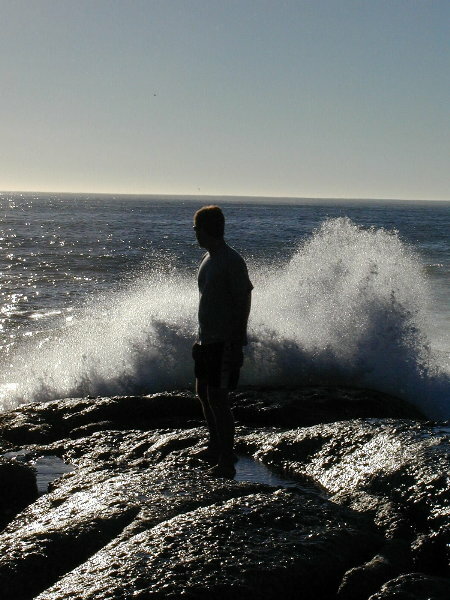 False Bay is a natural bay that stretches along the peninsula's eastern coastline from the Cape of Good hope Nature Reserve at Cape Point to Cape Hangklip. It is known as false bay because navigators mistook Cape Hangklip for Cape Point which resulted in many shipwrecks in the bay with its strong cross winds and rocky routes. During the right season (May-Sept) there is great whale watching in the bay. With our tour guide we drove along the coastal route through Lakeside, Muizenberg, St James, Kalk Bay, Fish Hoek, and Simon's Town to Cape Point. Supposedly Miller's Point is super busy in Spring when the southern right and humpback whales and Bryde's whales congregate on the point. We ate lunch in Miller's Point at the Black Marlin, one the country's most highly acclaimed seafood restaurants. It was actually very good. 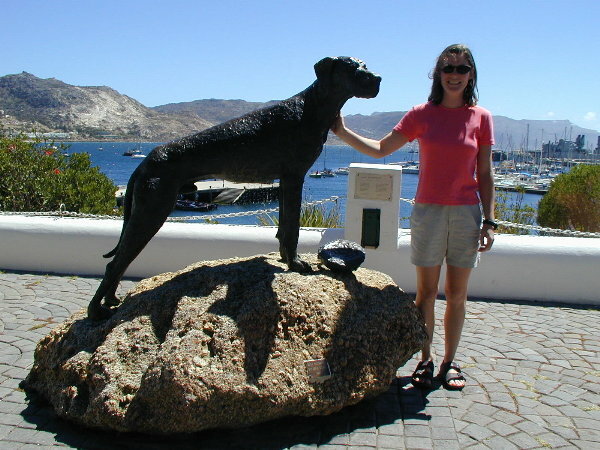 In Simon's town at Jubilee Square, we visited the statue commemorating Royal Navy Able Seaman Just Nuisance, the only dog enlisted in the Royal Navy. Supposedly, Just Nuisance, a huge Great Dane used to lead drunken sailors back to their boats or trains after long nights of drinking. He became such a common fixture in the area that he had his own seat on the trains and defended it fiercely. But only enlisted men were allowed to ride for free on the trains/boats, and they had come to depend on Just Nuisance, so they enlisted him with the lowest rank in the Navy. The main reason we mention any of this is because it made us miss Bailey (our dog). We drove around Constantia with our guide. It is a somewhat upscale suburb, but also the site of the first vineyards in South Africa, and the only ones close to the city. Supposedly, the Dutch taught them how to make wine so that they did not have to carry wine for the sailors all the way from Europe. Every Sunday there is a huge flea market in Green Point in the parking lot of the stadium. Many hundreds of vendors have tents selling African arts and crafts, household items, books, food, etc. We bought some English books from a vendor who had an amazing selection of novels. There must have been 200 vendors side by side selling the exact same African crafts at vastly different prices. Of course you negotiate lower prices but it was humorous to hear their starting price. We did not buy many items because of the huge cost of shipping anything back to the US. 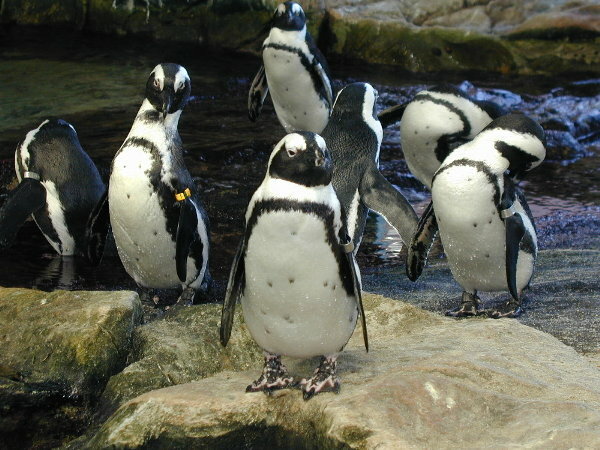 We visited Two Oceans Aquarium at the Waterfront on a Sunday, which is the primary 'feeding' day. There are over 3000 species of fish housed in the museum. 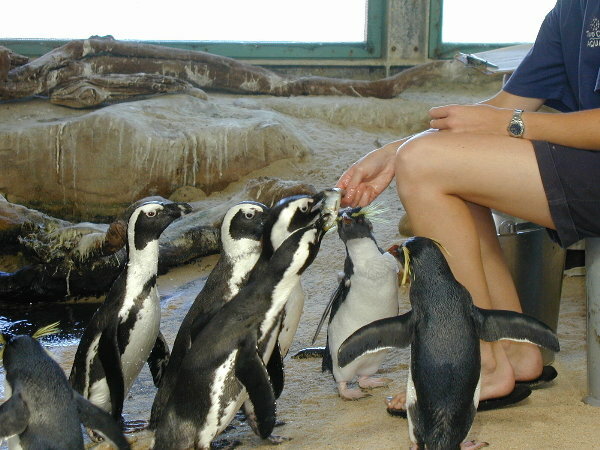 We watched the feeding of penguins and many other fish. 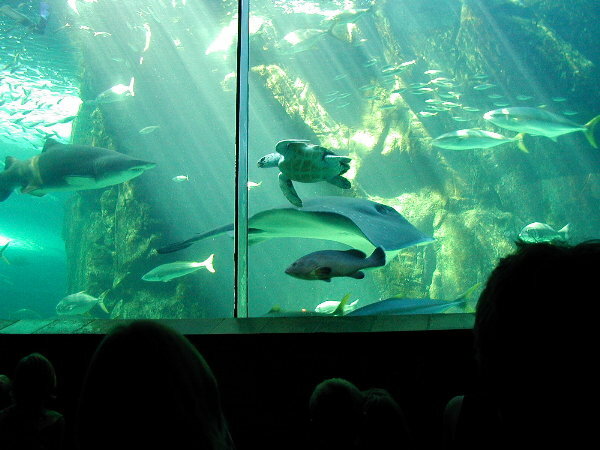 But the feeding that draws hundreds of tourists is the the shark, ray, and turtle feeding in the 'Predator' tank. We sat in a very crowded area while divers handed fish to the 6 foot sharks -- it was pretty interesting. One of the divers holds a stick to fend off any over-excited sharks. Panoramic view of Table Mountain, a major landmark of Cape Town. Picture from our room in the Cape Sun hotel in downtown. The frequent 'tablecloth' of clouds covering the mountain. Sunset from our Commodore Hotel balcony. Sunset the very next night from same Commodore Hotel balcony. 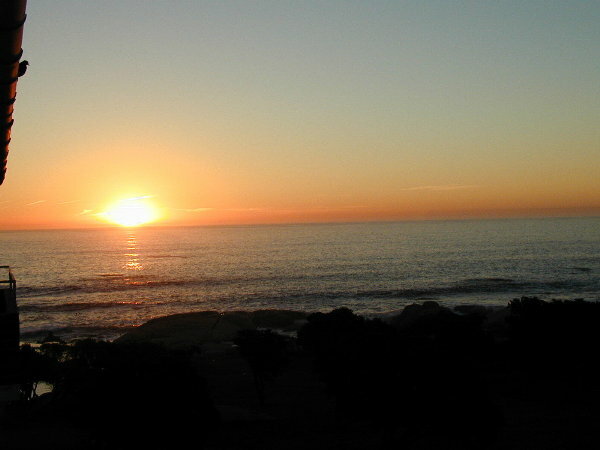 View from our Camps Bay Terrace guesthouse room. 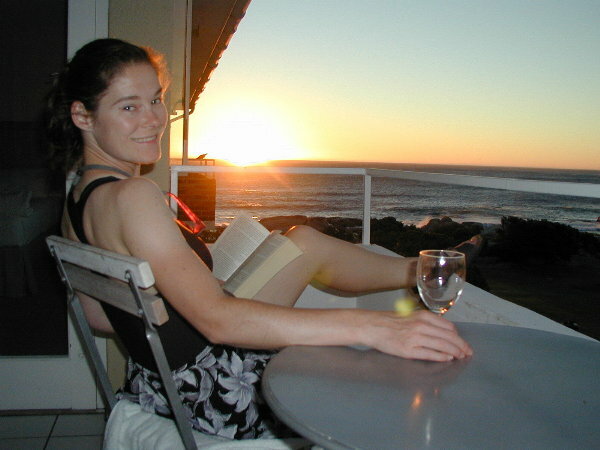 Kristen enjoying the sunset from the guest house balcony. Mini-panoramic of the guesthouse sunset. Panoramic of Camps Bay main beach. Our last stop -- Brighton Court apartment on the main street, overlooking the beach. Nice view from the room! 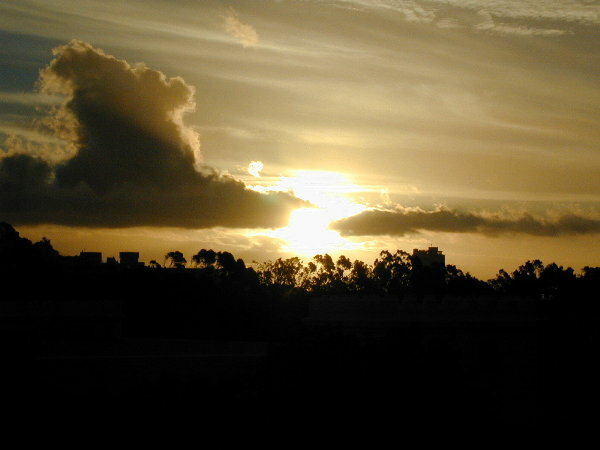 Sunset from the apartment balcony. Dan chilling with the view. Panoramic view from the apartment beach-facing balcony . Panoramic view from the apartment mountain facing balcony . 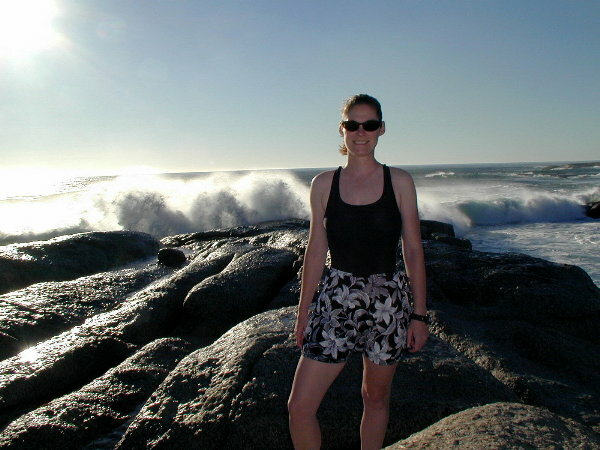 Kristen on the rocks of Camps Bay main beach. Dan on the rocks as the tide comes in. Staying on the rock as the waves consumed the rocks was a challenge! What a small world! 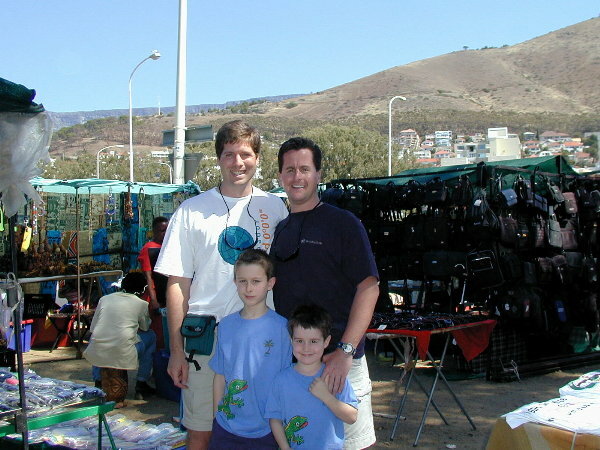 We saw friend/co-worker Eric Andesrson and family in the Green Point flea market. They reside in London. 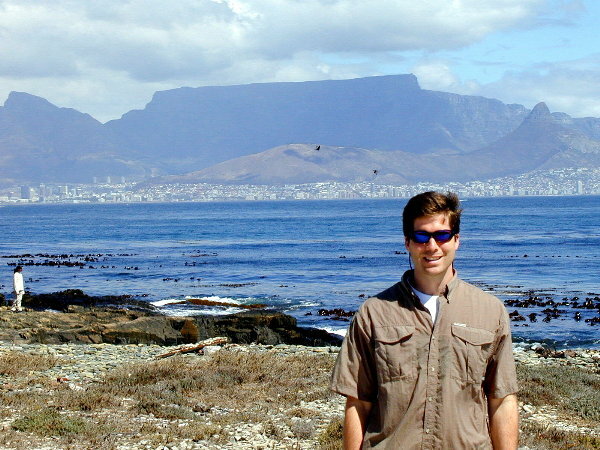 Posing at the Cape of Good Hope -- there was actually a line for this picture! 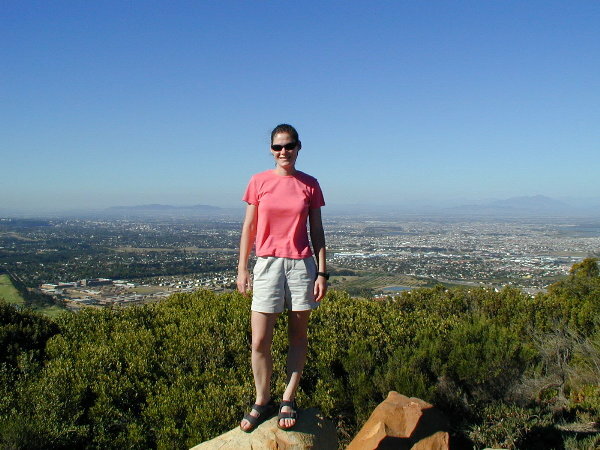 On our way to the Cape, Kristen standing on the scenic edge of Cape Town suburbs . Panoramic of False Bay, the large southern bay which Cape Point/Good Hope borders. 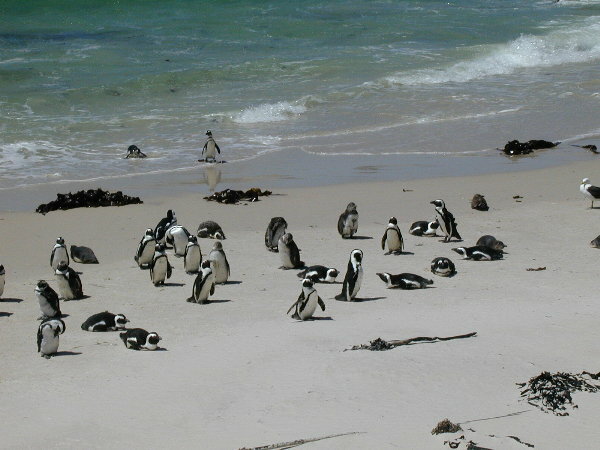 Penguins at Boulders National Park. They migrated here, so the government created a park for them. We are hanging with Nyana, the world's fastest mammal, literally (according to Guinness Book of World Records) ! 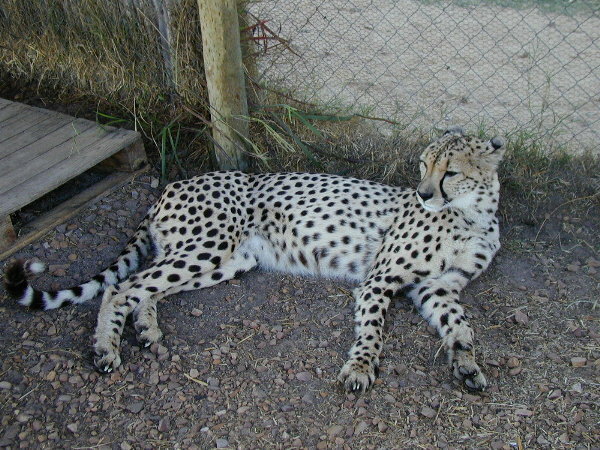 Nyana and other Cheetahs live in the Spier Cheetah Reserve near Franschoek. 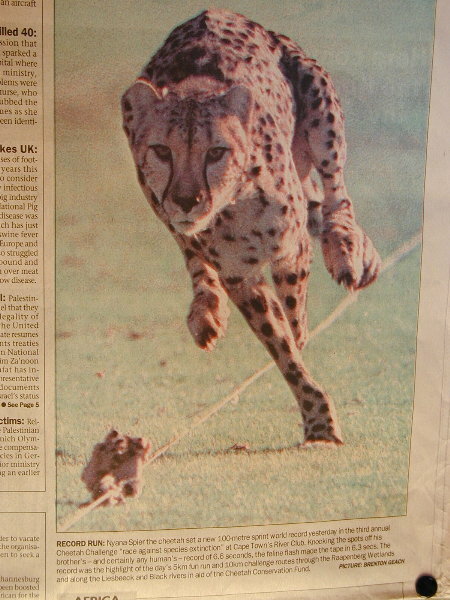 Nyana had won the 'fastest cheetah' race on Wednesday, February 21, 2001. This is from the newspaper the next day, when we visited. We spent a day in wine country, outside Cape Town. We toured Nederburg winery. Since it was harvest time, we got to see the whole process in action. Not much action in this part, though. The Fairview winery and cheese shop imported Swiss mountain goats for the cheese. This 'mountain' to climb makes them feel at home. 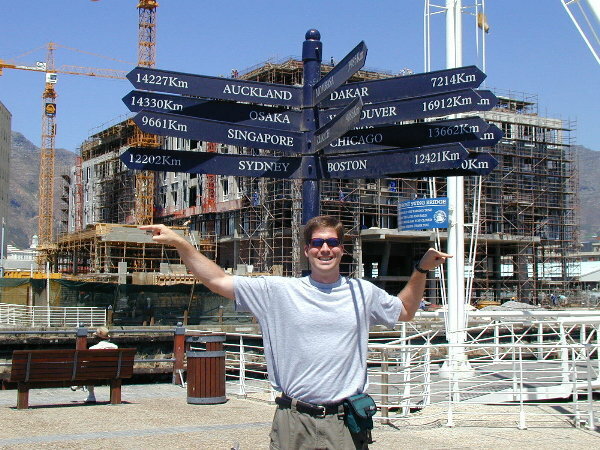 One of only a few reasons Dan could not live in Cape Town:) Check out the sign! We visited Kirstenbosch Botanical Gardens, on our way to climb table mountain. 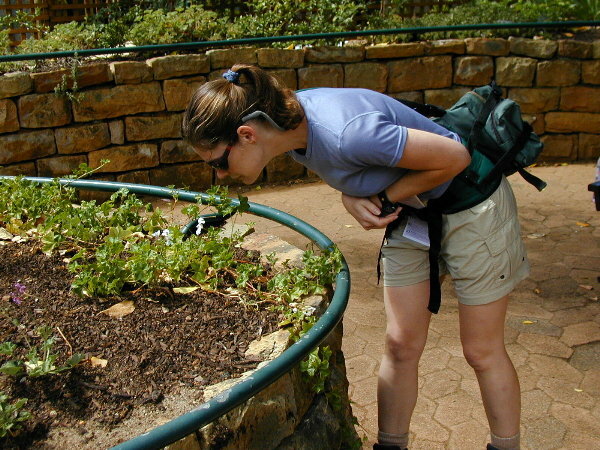 Kristen is appreciating the aroma garden. 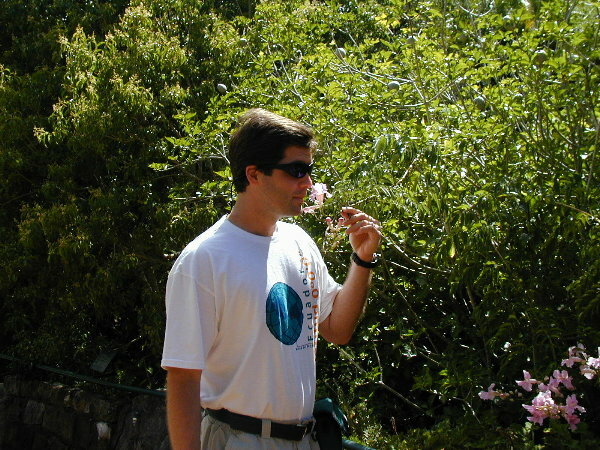 Dan acting like he is appreciating the aroma garden. This was Dan's favorite plant -- check out its uses! 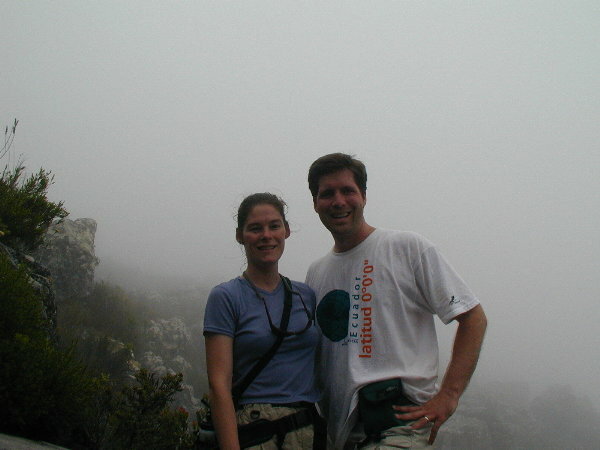 We climbed Table Mountain (1086m) from the gardens entrance. This climb was fun, but not for everyone -- very steep. Some parts had ladders to make the climbing easy. Other parts we had to find our own path -- this made it interesting. Not 100% sure we took the official path the whole way..
Maclears Beacon is the highest point on Table Mountain. We were the only people near the top. The full 'table cloth' was in place at the top. Here we practiced with our mini-tripod. 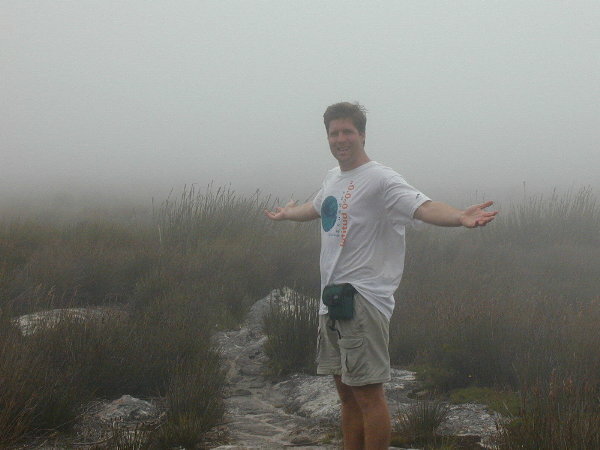 With the thick clouds, we could not see more than 30 feet and there was no clear path to traverse the 1.8km long summit. And, of course, it was 20° colder in the clouds and 20 mph winds -- they tried to blow us off the sharp edge of the summit. Once we traversed the summit from the beacon to the cable cars, we found the table cloth did not cover the whole top. Panoramic of Cape Town from the top. We went on a resident-led tour of Langa Township, where blacks were forcibly relocated during the 1960/70s. These are the working class homes. These are the 'hostels', a step down from the working class homes and very crowded. The residents were very friendly and let us into their rooms. 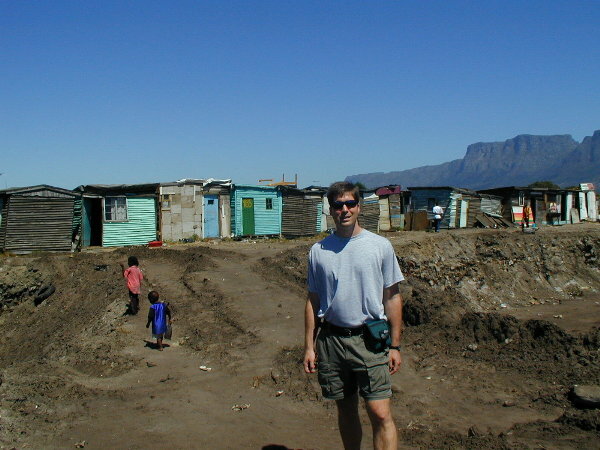 The middle class area, or 'Beverly Hills of Langa, was pretty nice. We were surprised at the clear class separation in the settlement. And the 'informal townships', or shanties, built around the highway or wherever there was unfenced space. 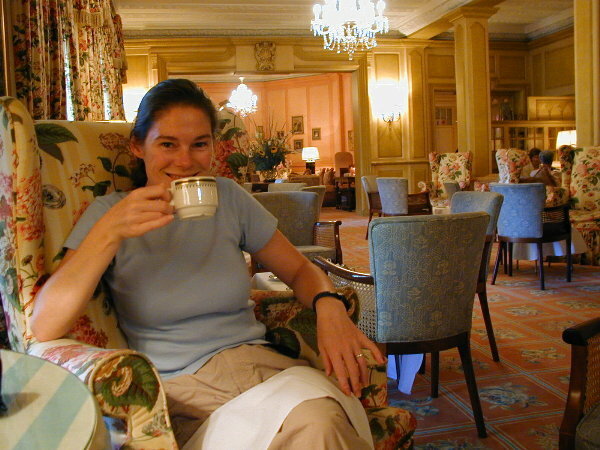 Kristen insisted that we participate in the English tradition of 'high tea' at the Mt Nelson hotel. 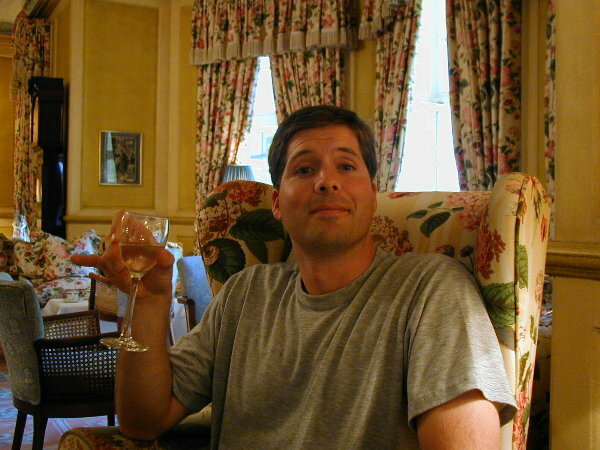 Dan trying to act the part for high tea. We visited Robben Island, the political island prison where Nelson Mandela was held for 18 of his 27 years of incarceration. 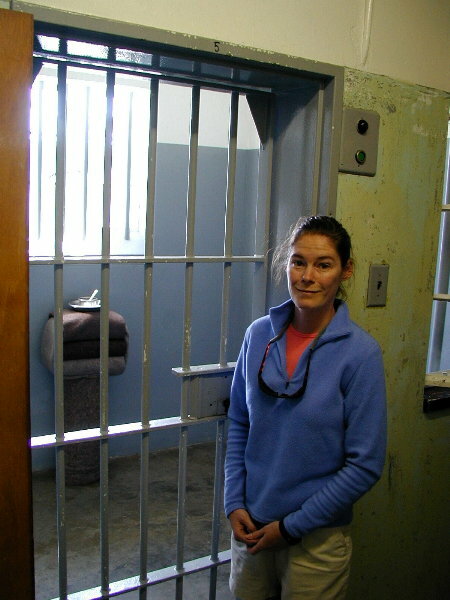 Kristen standing by Nelson Mandela's cell. 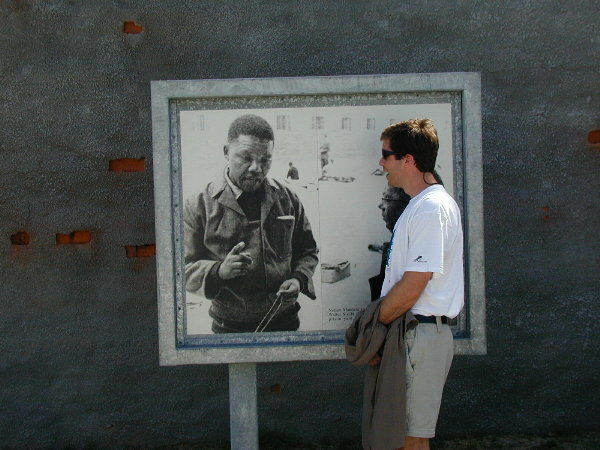 An ex-prisoner of Robben Island led the tour. The only tour option was the typical 'group tour', our first herd tour of the trip. Actually, it was fine. From Robben Island we had great views of Cape Town. The Island is 7km off shore in Table Bay. 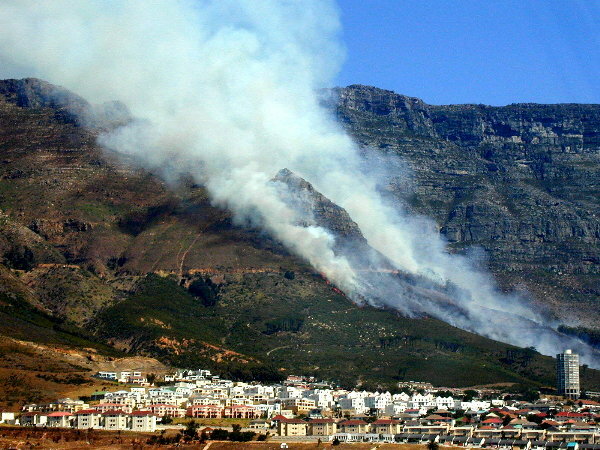 As we compare Cape Town to a California city...they have lots of fires during the dry season. They ran fire helicopters for 2 days to extinguish Table Mountain. Cape Town is a long way from everywhere. We visited Two Oceans Aquarium on V&A Waterfront in Cape Town. 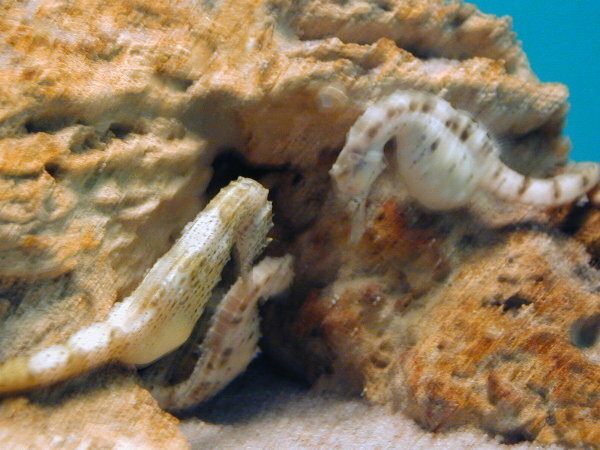 First sea horses Dan had seen. We included extra aquarium pics for our nieces/nephews! The penguins were very playful -- they took turns jumping off the rocks into the water. 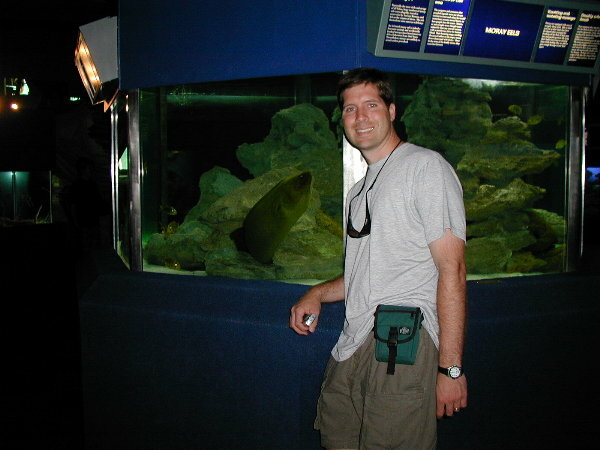 Dan with a Moray Eel. 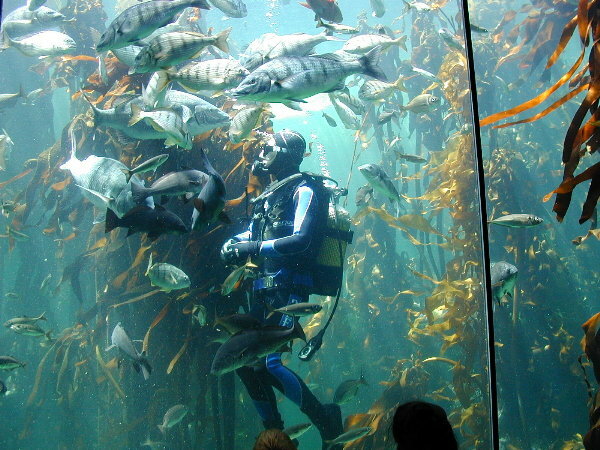 A diver feeding the fish in the Kelp Forest. 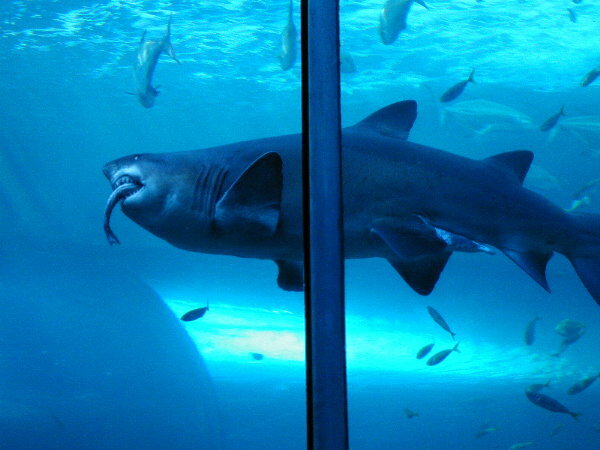 A ragged tooth shark after taking his food from a diver. 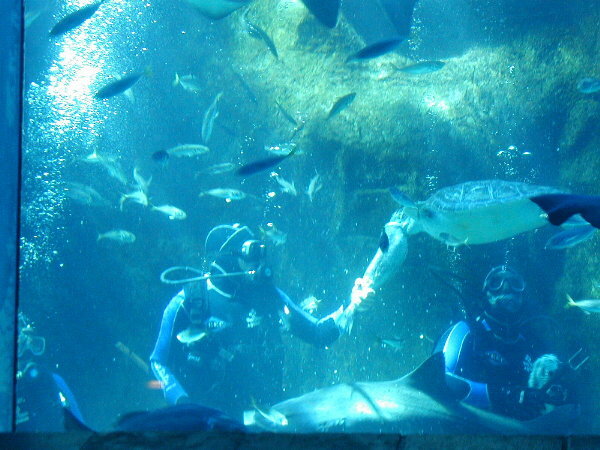 Divers feeding a turtle and the shark. 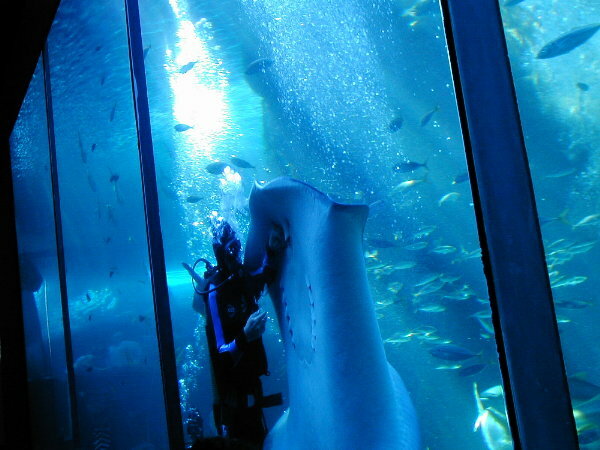 Diver feeding a huge stingray. The ray, turtle, and shark all in the same picture. We took a half day tour of District Six museum and Langa Township. District Six was a Cape Town city area where the Apartheid government removed 60,000 blacks between 1968-1980. They leveled the area to build an all white development. They attempted to get foreign investment to help develop the area, but by that time the world was frowning on their discriminatory practices. The only major development in District Six is the technical school built by the government. In 1998 they started a land restitution process to try to determine who owned what land and figure out a way to make amends. 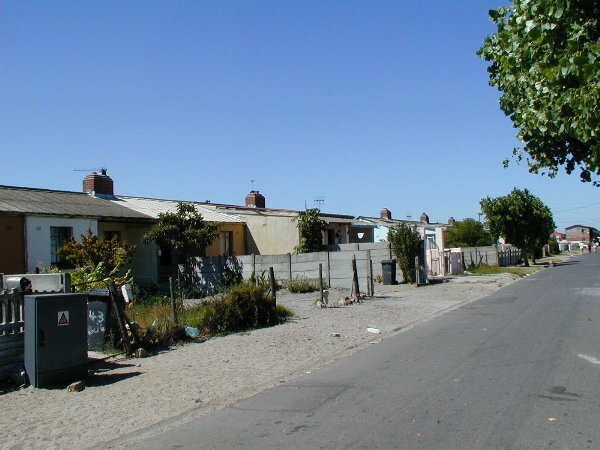 The Langa Township was relocation spot for blacks moved from desirable areas of Cape Town in the 1960/70s. A resident of Langa took us on a walking tour through the many areas of the township. We walked through the working class sections (connected houses), hostels (less nice apartments), middle class section (relatively nice houses), and the infamous shanty areas (shacks of wood/cardboard). Although much media attention has been brought to the crime and unrest in Langa and other townships in the past, it was clear that things have changed. The people were very open with us (basically a group of all white tourists) and allowed us to enter their homes to see how they lived. Interestingly, the goal of the tour leader was to show us that Langa was a real community with aspiring citizens that was no more dangerous than other communities. They believed that so much had changed for the better in only the last 6 years and that they would continue to improve their situation. 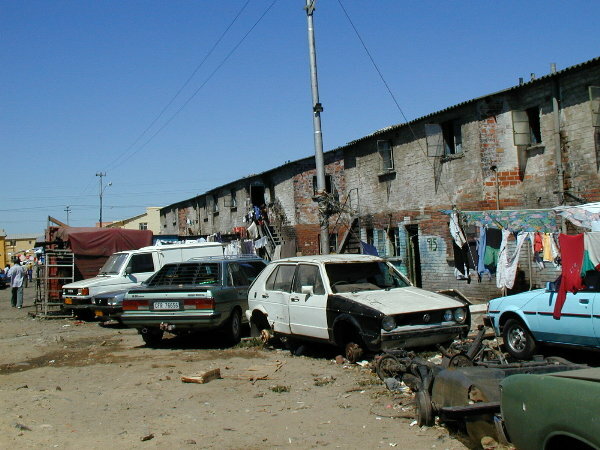 It was not until 1994 that the residents of Langa were even given ownership of their land. We spent a day with our guide wine (and cheese) tasting in the Cape wine country. 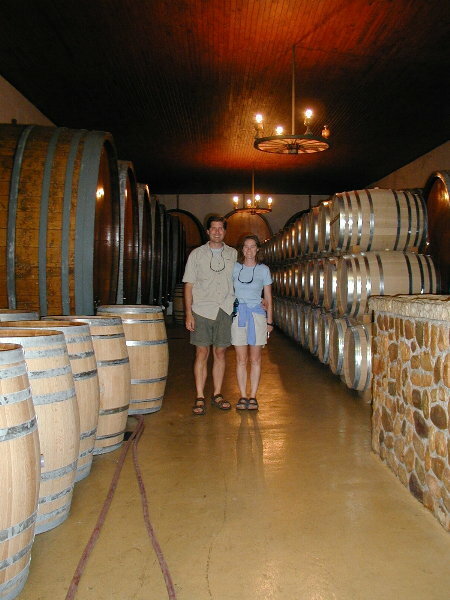 We took the 'Stellenbosch Wine Route', on which there 30 estates and cellars. We only stopped at 3 vineyards for wine tasting and did a winery tour at the first one. Because it was harvest time we were able to witness the entire wine producing process. 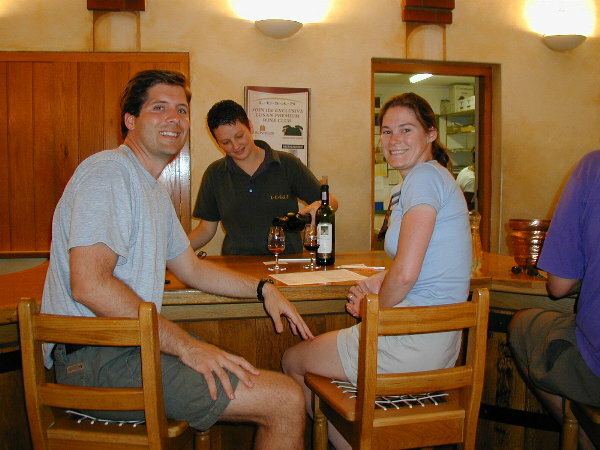 Even though we tasted many wines, we had a hard time finding one that we both liked a ton. We also drove through Paarl, one of the country's main wine-producing areas. Paarl was founded in 1668 six years after Jan van Riebeeck landed in Table Bay . We saw the 'Tall Monument' -- three tall structures pointing towards the skies, one for civilization of Europe, one for the heritage of slaves from the East, and one for influence of the African continent. Fairview, one of the wine and cheese stops, specialized in goat cheeses. 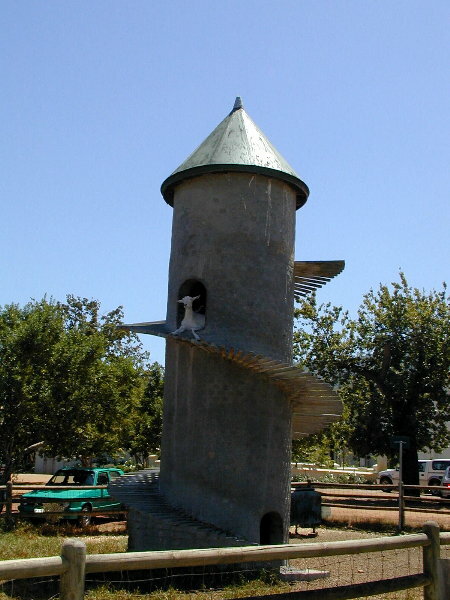 They had imported Saanen goats from Switzerland and built a tower with an external staircase for them to climb, simulating their mountainous environment. During our wine tour we drove through Stellenbosch, the 300 year old town started as a farming community for Dutch Eat India Company for ships supplies. It was the first settlement established beyond the immediate boundaries of the Cape colony. It is the home of seminary schools, and University of Stellenbosch (1918) -- one of the schools that only teaches in Afrikaans which eliminates most non-whites from enrolling. During our tour of the wine country we stopped in Franschoek, known as the 'French Corner' in reference to the 200 Huguenot families who fled persecution in France to settle amid the Cape mountains in 1688. Supposedly, the town boasts the largest number of award-winning restaurants in South Africa. We ate an outstanding lunch at Franschoek Country House in its open courtyard in the shade of many trees. Greenmarket Square is in the middle of downtown and is home to a daily market. On Sunday all the vendors move their booths to the big market in Green Point. Once again all the wares are the same African crafts we saw in Tanzania. As we walked around the square we were approached many times by 'street kids' asking for money. We heard different stories about their situation from locals, but they say that many of the kids live with their parents but skip school and come to beg from tourists. No matter the reason we had been told to not give money to the beggars so we just walked on, uncomfortably. During our tour we visited Cape of Good Hope Nature Reserve which comprises 25 miles of coastline and is home to over a thousand different floral species and tons of wildlife including birds, reptiles, cape fox, baboon, cape mountain zebra, antelope, eland, and ostrich. Mostly, we just drove through it to see the southwestern- most point of Africa. At the light house on the point, the wind continually gusted like the worst windy days in the city. 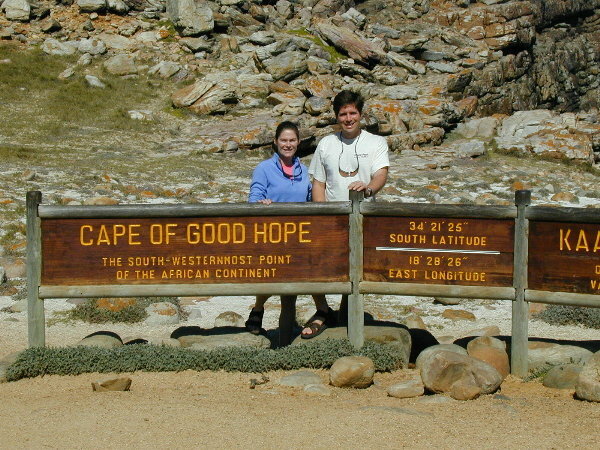 We read in a local magazine that Cape Point/Good Hope is the second windiest spot on earth after Cape Horn (South America). Cape Point, which is in Cape of Good Hope Nature Reserve, is often mistaken for the meeting place of the Indian and Atlantic Oceans. However, Cape Agulhas is the southernmost point in Africa and is the meeting place of the oceans. We did not visit Cape Agulhas because it was 4-6 hours from Cape Town. On the way back from our wine country tour we visited Spier, home of a cheetah conservation center, and more importantly, home of Nyana Spier, the fastest land mammal in the world, according to the Guiness Book of World Records. They had held their yearly cheetah racing contest the day before we visited, and Nyana had regained her title by reaching 100 meters in 6.6 seconds, reaching over 60mph. 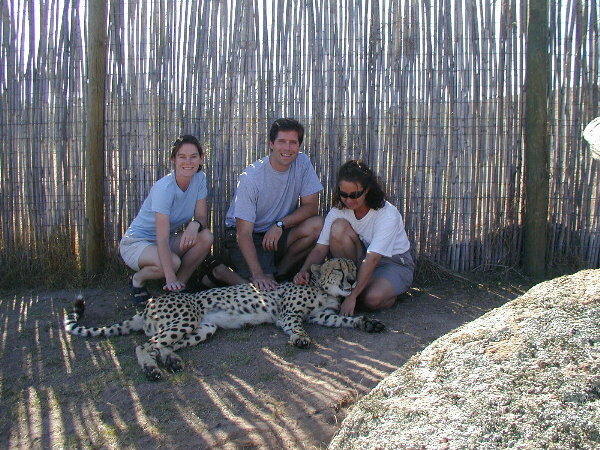 For a small fee, we were allowed to pet Nyana in her pen. Unfortunately, the ranger had to be in there with us to ensure that Nyana did not see us as a snack -- unfortunate only because the pictures included a stranger! Camps Bay is an exclusive shoreline suburb of Cape Town that lies at the foot of Twelve Apostles, the mountain range that extends south from Table Mountain. On the hill with amazing 270° views of the ocean lie huge mansions. Surprisingly, houses that would cost many millions of dollars in the US can be bought for less than half a million dollars. This is largely due to the exchange rate of 7.5 rand to 1 dollar. If it were not 18 hours from Atlanta, we would have seriously considered an investment! During our tour we drove through the fishing village of Hout Bay. Because of its relative seclusion and the staunch 'patriotism' of its citizens it has unofficially become known as the Republic of Hout Bay, and realistic passports can be purchased from enthusiastic custodians. Its name comes from a Dutch/Afrikaans word for wood. The Bay was aptly named because this is where wood was taken to build ships in early days of the the Cape colony. 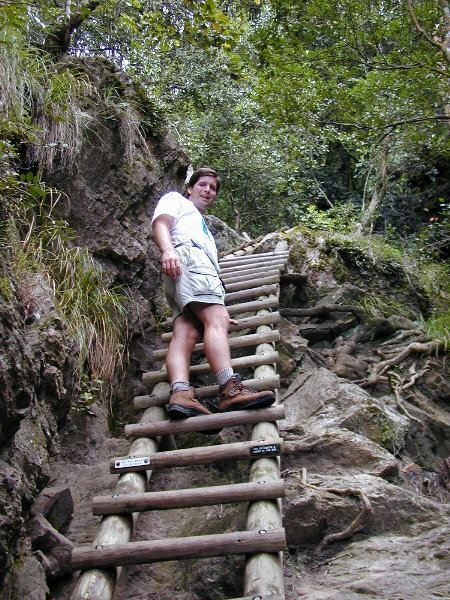 Kloofing -- missed it :(! We tried multiple times to go kloofing, but we could not make it the days they offered the trips or when we could they cancelled the treks. 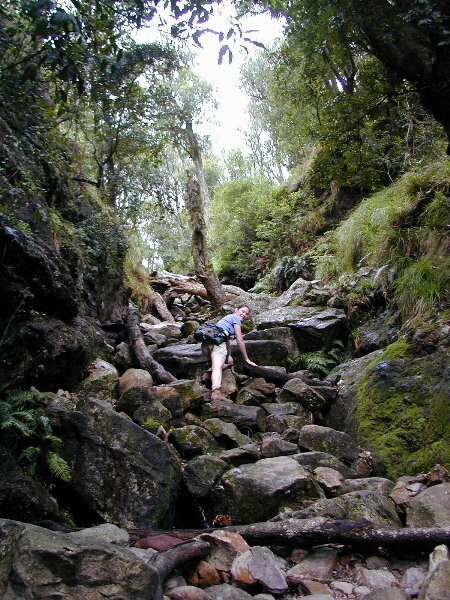 Kloofing involves hiking into a gorge to the origin of a river, then hiking down the river and jumping off the many cliffs into the pools below. They say that it is about a 12 mile hike with cliff jumps from 15-65 feet! It sounded like a blast and we are very disappointed we did not do it. We have included it here only for anyone thinking about a visit or to remind us in case we go back. Mt. Nelson Hotel is a very old and expensive formal European hotel in Cape Town. They honor the English tradition of 'high tea' every day from 2-5PM. Based primarily on Kristen's wishes, we attended this tradition. Dan was pleasantly surprised that he could get something other than tea and they have a huge buffet of food to go with the tea. Even though it was mostly 'snooty' food and atmosphere, it was fun. We had not had cell phone service in any of the countries we had visited to this point. We finally called Powertel in Atlanta (collect) and they confirmed that they had not correctly enabled global roaming on our phone. And, they confirmed that they could do nothing for us remotely. We had to have a way for travel agents to get in touch with us (for onward trip planning), so we bought local cell phone service. They make it pretty convenient because they sell SIM cards (USD$15) that are duration based and use pre-paid minutes. Their air time rates seem like rates from 5 years ago in the US (USD35¢/minute, no bulk plans) but their convenient pre-paid/recharge approach is good. Almost every store sells recharge cards so when your cell account gets low, you just dial in a code from the recharge card and it increases the account by the value of the card. The phone worked all over South Africa. 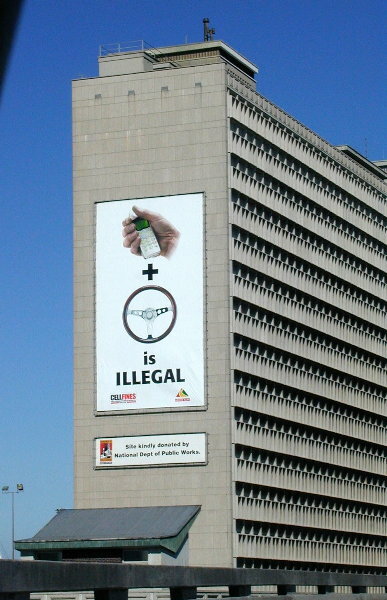 Even though the cost is relatively high compared to other South African items, everyone had a cell phone. Many stores had signs asking that you please hold conversations outside the store! Our second pass through Nairobi, Kenya just after the Mount Kilimanjaro climb marked the end of pre-planned trip, and from that point we were free to go wherever we wanted. Since we had been traveling on a tight schedule for 5 weeks and we had just trekked for seven days on Kilimanjaro, we were ready to go some place and just relax. So we decided to head straight to Cape Town versus going to places we had considered visiting after Nairobi, including Mombasa, Madagascar, or Seychelles. We had only reserved two days in the Norfolk Hotel in Nairobi so we needed to move quickly to plan our trip to and accommodations in Cape Town. We tried to work with A&K to get flights and hotel set up, but as of the middle of the second day they had not worked anything out. We decided to take it into our own hands. We had been checking for hotels on Expedia.com and Travelocity.com but both showed no vacancy in the hotels/areas we wanted to stay. But we figured the flight was the most important, anyway. At 4:30PM the day before we were supposed to leave, we asked the hotel travel agent to help book a flight that Dan had found online, as she was ready to go home. Because the airline (Kenyan Air) needed payment immediately she could only reserve it and told us to be at their travel desk at 5AM the next morning for the 7:15AM flight. The only reason we went through them versus doing it online, was that online could not get the ticket to us, and we knew it was international with two different carriers, and we wanted to check our bags all the way through -- something the travel agent said we would be able to do. Checking bags all the way through was important because we only had 70 minute layover in Johannesburg on the flights we had selected. 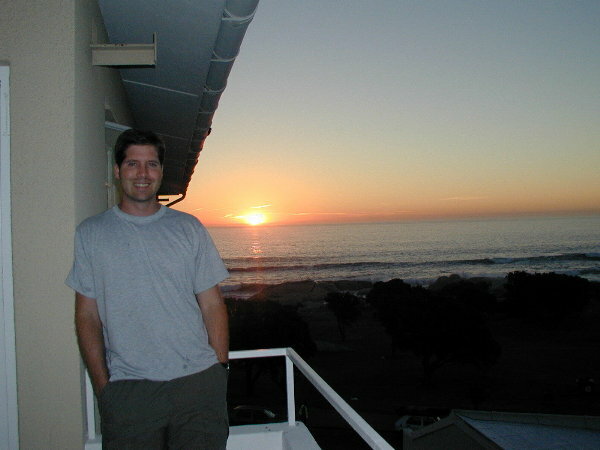 At 4AM that morning Dan found a room in Cape Town that had just opened up via Expedia.com and made the reservation for that same day. We arrived at the airport at 5AM, and woke up the travel desk representative (literally). She worked for over 1.5 hours trying to get the multi-carrier ticket printed (technical problems). With 20 minutes to spare, we had tickets and went on our way. When we arrived in Johannesburg, we waited for 45 minutes (out of our 70 minute layover) in the passport control line! The agent suggested we check for our bags at the carousel even though they were checked all the way through to Cape Town. Thank goodness she suggested that -- they were there waiting for us to be carried across the entire airport and checked in at the other airline. Fortunately, we made it and had a comfortable flight into Cape Town. When we arrived at the Commodore Hotel on the V&A Waterfront, and they took us to their Executive Suite we had reserved, dubbed the Balmoral Castle! We decided that we had been lucky -- the hotel was the perfect location and was much less expensive than the hotels we thought we would go to. It might seem a little odd to dedicate a whole section to the cost of purchases during our stay, but we think it gives some justification for our wayward thoughts of moving here:) It shows what the strong dollar (or weak local currency) can do even in a modern city. Avis rental car -- we rented a car for a weekend (though not a very good car) for R$57/day (US$7.35)! We upgraded to a much better car and paid about $18/day. Dinner at Spur -- one of our newly favorite restaurant chains. We took Eric Anderson and his family (total 4 adults, 2 children) to dinner with appetizers, wine, beer, and tons of food and the whole bill with tip was US$48. Dinner at Blues -- very upscale place, for appetizers, food, wine, and dessert only $US30. Clothing at Edgar's -- we bought Kristen two shirts, a bathing suit and sarong, and Dan a bathing suit all for US$60. Haircut for Dan -- Dan walked into the first place he saw next to the Cape Sun downtown hotel, and paid $4.50 for the haircut (and no, electric shears were not used!). All day guided tour -- For a full day drive around and outside Cape Town including entrance to all the exhibits it was only US$170 per day. Housing -- Ok, this is where it gets back to the real world, if you go for luxury. The Commodore executive suite (second from best room) R$1800 (US$230) per night, the Cape Sun Presidential Suite (top floor) R$3000 (US$380) per night, and in Camps Bay, the guest house R$750 (US$100) per night, and the Camps Bay apartment R$490 ($US60) per night. HP Re-Writable CD player -- our very portable RWCD backup device for the laptop quit working when we arrived in Cape Town. The only RWCD device available in Cape Town (at the only CompUSA type store) is much larger and cost R$3000 or around $400 -- a little more expensive than it is in the US, but a necessity. Almost everything you buy in South Africa is subject to a 14% Value Added Tax (VAT) which is already included in the price and itemized on the receipt. Tourists can get a refund of the VAT on items they take with them out of the country. This means that items like gifts, T-shirts, books, and RWCD drives are 14% less than the price marked! The big catch is that we had to produce the goods at the airport with our boarding pass and all receipts, wait in a line for 45 minutes for customs to confirm we were taking the items out of the country, wait in another line for 30 minutes to get a VAT refund check, then wait in a third line for 20 minutes at the currency exchange counter to cash the check. All for $108 refund! We were told that Cape Town had amazing restaurants. We are not sure we agree with that completely, because we had many disappointments in some of the supposedly good restaurants, but our food preferences are not like everyone's. We include here an exhaustive list of restaurants we visited just in case you go there and want our opinion (or for us to remember if we go back:). Very Good Combination of $3 cafe, Taco Mac, Dennys, and Shoney's -- consistently good.. Many -- fast food chain. Ok. Over- hyped chicken place. Wendy's chicken as good. Very Good. Well-hyped Indian food. Wonderfully spicy. Cape Sun Intercontinental - downtown. Not Good. Well laid out buffet, but food not good. Not Good. Over-hyped seafood place. Portuguese rolls great, rest of food fair. Pretty good Basic medium/upscale pizza plus some pasta dishes, but pretty good. Ok. Great garlic bread, bad prawns. Rest ok.
Good A local pizza delivery chain. We had great oven baked subs. No idea about the pizza. False bay, near Simon's town. Very Good Great calamari, stir-fry and fish. Best for lunch because great views. Very Good Great rolls and all around great food. Best for lunch because of atmosphere. Very Good Lots of veggie food, but all is good. Very Good The best calamari and line fish -- could have eaten every day! Very Good Basic mid-scale pasta/pizza, but very good. Ok Nice atmosphere. Supposed to be very good. Not bad. (+27 21) 415-1000 In V&A Waterfront, 3 minute walk to big area/mall. Most reasonably priced luxury rooms. 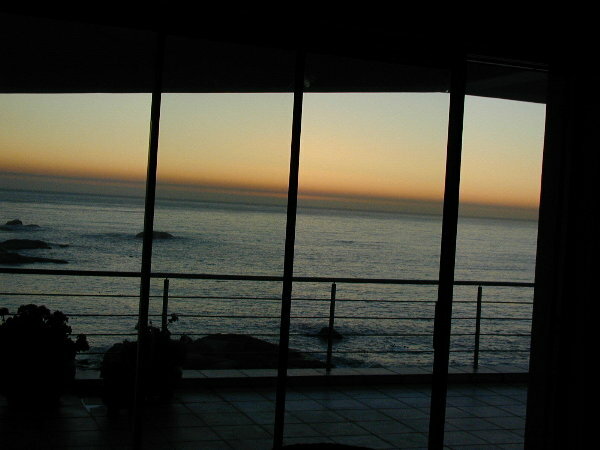 (+27 21) 488-5100 In center of down town, but unobstructed views of Table Mountain. www.campsbayterrace.com Great views, just up from the water. No common room, but Gila and Chris partially retired from their software company are very 'normal'. www.campsbaybeach.com VERY friendly and helpful, and good inventory of housing. Ask for 28 Brighton Court -- the best view apartment. Ask for Jackie Very professional, flexible and personable tour guide. adele@mushindasa.com Very service oriented specialist on South Africa locations. http://www.waterfront.co.za/home.shtml Good source of information about the Waterfront offerings.